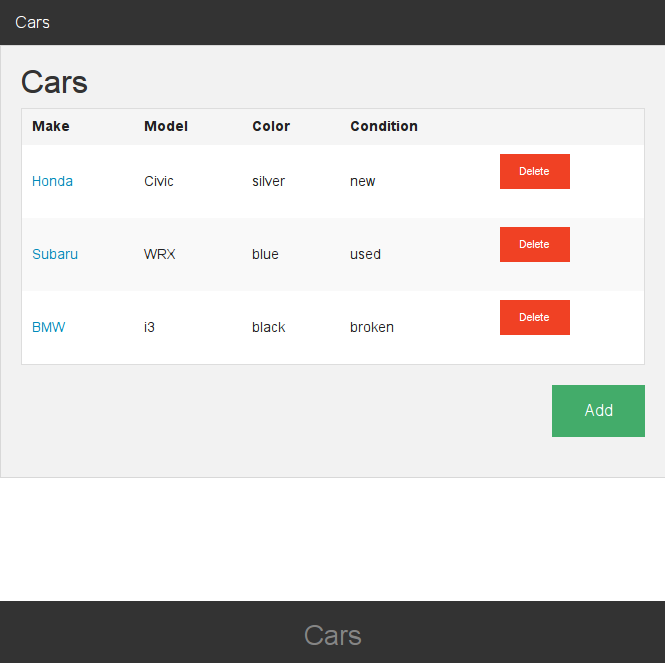 In the last post we set up the new car view. In the final post let’s add the ability to delete a car and wrap up this series. Now if you click the delete button you’ll see an HTTP delete 404 since we haven’t set up that action in Rails yet. Head over to app/controllers/cars_controller.rb to add the destroy method and allow it in the before_action. Ember also has views, which adds yet another set of interactions that are possible. It can be very confusing to know what code goes into which object. Since this guide is really only concerned with building persistence with a Rails back-end, we won’t go into these. You can find the rest of the Ember documentation right here. That’ll do it! You now have a rather naive form that can create, show, update, and delete a resource. Finally, there is a lot more to Ember than simple CRUD operations. It is really a toolkit to provide a rich user experience on the client-side. It’s quite likely that you’ll need to do some kind of persistence-over-http CRUD operations for a huge amount of applications out there. That story was a bit obtuse, so hopefully this guide helped you get started. If I missed anything, or something is not idiomatic, let me know in the comments or via the contact form!